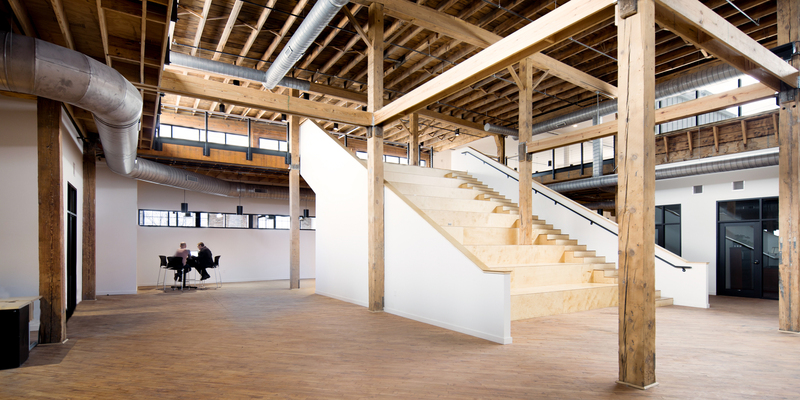 The Idea Foundry renovation focused primarily on the second floor of the old Franklinton factory building. The entire space was transformed into a unique mixed use space featuring, meeting rooms, offices, and collaboration spaces. The exterior got a face lift with new paint, windows, and doors. The window openings were opened backup to the original size, and natural light once again floods the space. Inside, the original hardwood floors were restored, and the brick was left exposed. Overall, the original building details were preserved and enhanced, while other modern finishes were added to make a new usable space. Look back at some of the construction action on our YouTube Channel.